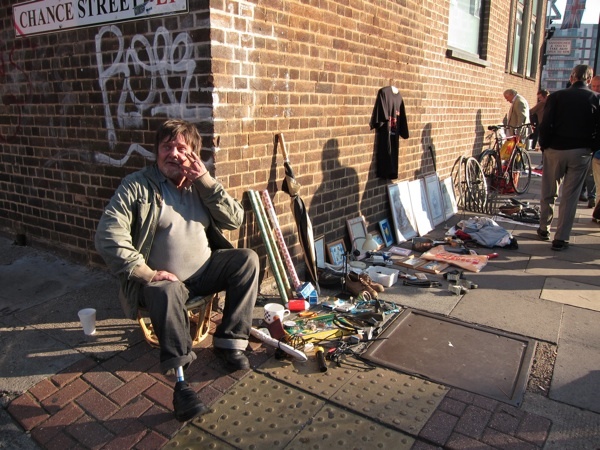 When I first came to Spitalfields, at dawn one Sunday morning in Winter long ago, I was amazed to find Brick Lane full of fly-pitchers – people selling a few items directly off the pavement. 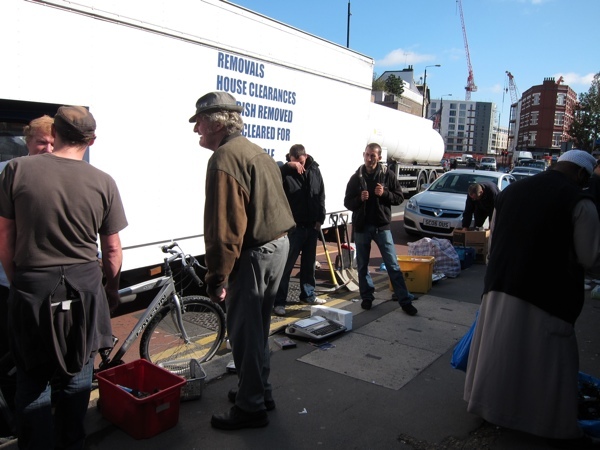 Yet as the years have gone by, these pavement traders have been pushed further and further out until they find themselves at the very edge of the territory now, crowded together along the Bethnal Green Rd upon a narrow strip of pavement beside the site of new a shopping mall. Literally at the margins, these people are suffering at the heavy hands of market inspectors constantly harassing and threatening them, causing them to pick up their things and flee – only to return later and do a little more trading before the next purge happens, in a tragic ongoing game of cat and mouse. 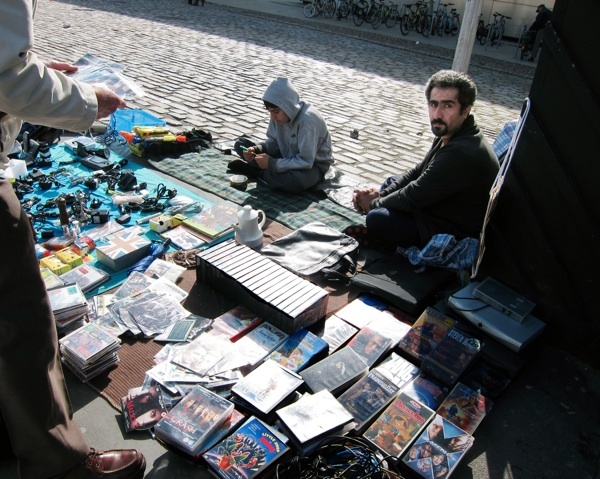 Commencing in the early hours and sometimes gone by first light, the existence of these traders in unknown to many visitors that come to Brick Lane on Sunday. 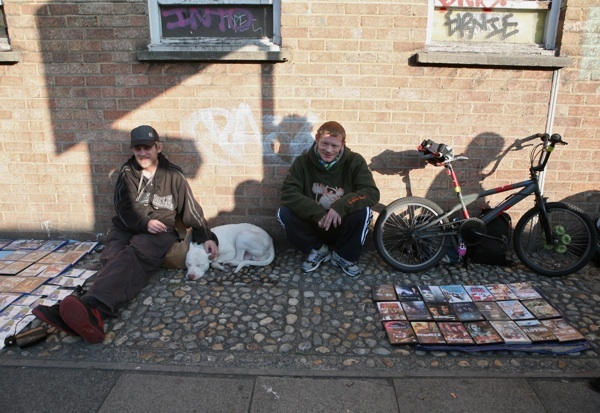 So, for the last month, Spitalfields Life Contributing Photographer Colin O’Brien has been down there among the fly-pitchers and the result is this remarkable set of pictures which acknowledge the dignity of these people who are being subject to such unnecessary humiliation for sake of wanting to sell a little bric-a-brac. 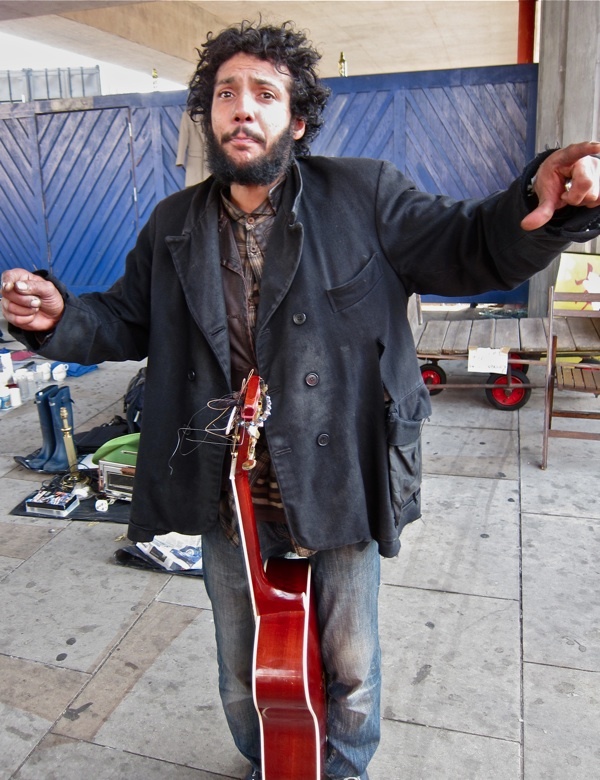 “My name is Jason John, I’m writing you a damn good song” - these were the first words I heard when I came round the corner of the Bethnal Green Rd into Norton Folgate last Sunday morning, just as a street musician with curly dark locks appeared with theatrical aplomb from behind a telephone box, wielding his guitar and offering a tuneful accompaniment to the lively scene of pavement trading sheltered by the vast railway bridge arching over us. 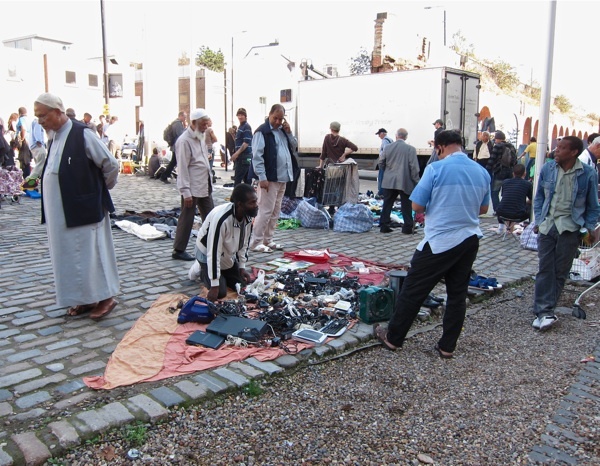 It can be a pitiful spectacle to witness the modest possessions that people are selling here, asking prices as little as 10p, and yet this market is remarkable for its vibrant life and sense of camaraderie that, ironically, has strengthened in the face of the current threat. 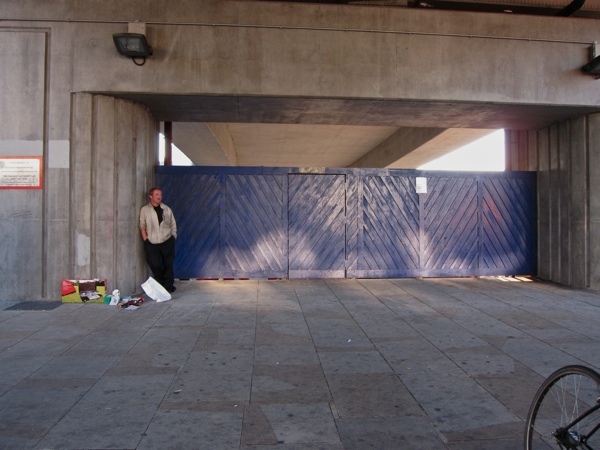 Over the weeks that Colin has taken his pictures, a stack of black sea-containers were put in place and the hoarding behind the fly-pitchers came down to reveal the pop-up shopping mall which will open here shortly. Now a fence with the logos of the international brands who will be selling their wares here in future serves as a backdrop to the fly-pitchers and the contrast between the two could not be more extreme. 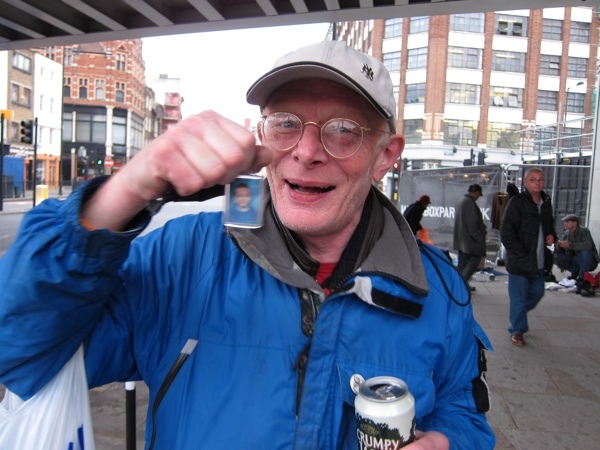 The developers who own the site are creating a temporary shopping mall to capitalise upon their investment whilst they raise the cash to construct a tower block for corporate clients and – for the sake of this – a few pensioners, the handicapped, those struggling on benefits and the dispossessed are being criminalised because they try to sell a few of their belongings to raise a little extra cash on a Sunday morning. I spoke to a Jewish gentleman in his seventies as he arrived to place six worn shirts on the pavement for sale, casting glances nervously to either side. 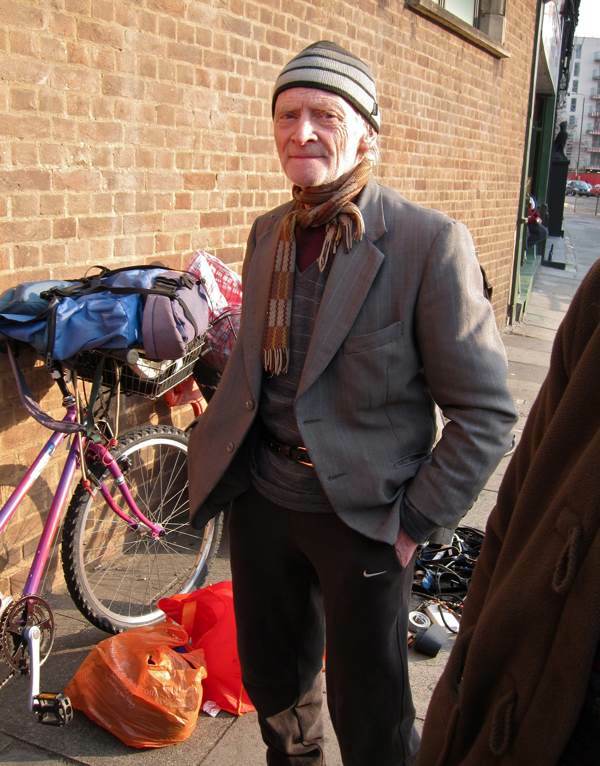 I bought one of his shirts for 50p in order to strike up a conversation with him, yet within minutes he was harshly moved on and my 50p proved to be his sole income for his effort that morning.“They’re trying to get rid of the poor people!” exclaimed one woman in grief, too scared to consent to a photograph by Colin. The argument is used that the fly-pitchers are unlicensed and they are blocking the pavement. 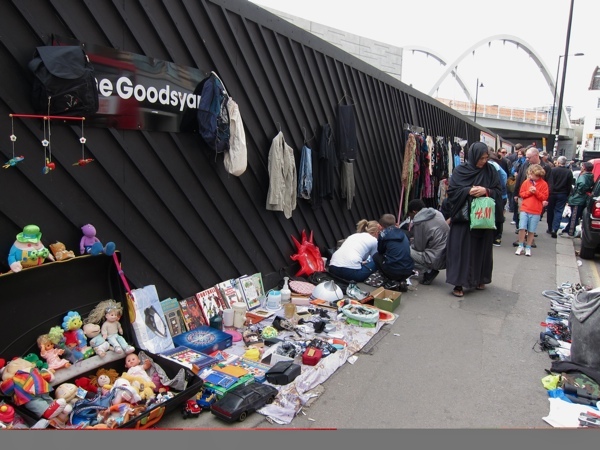 Yet the truth is that some have been coming to Brick Lane to trade for their entire lives, participating in the culture of unregulated pavement trading which has been in continuous existence in this corner of the East End on Sundays for centuries. And, if they are blocking the pavement now it is because they have been herded into this narrow space away from Brick Lane against their will. Gina of Gina’s Restaurant in the Bethnal Green Rd, who started her first cafe in Brick Lane with her husband Philip Christou in 1961, opens each Sunday now to serve the same people who have been coming all these years. When they are ‘purged’ by the inspectors, they take refuge in her establishment and if the old people have failed to make enough money to pay for a Sunday lunch – which was their sole intent in getting up before dawn and coming down here – then Gina simply gives them a meal. It is a sombre experience to sit in Gina’s Restaurant among those who have taken flight and recognise that these spirited characters are the people who have been in the market longer than anyone. The soul of the place resides with the fly-pitchers and their moral rights must be respected now – through the provision of a space where they can trade peacefully – rather than subjecting them to the current inhuman treatment which degrades us all. I moved to the area just over two years ago and I too have been saddened to see the way tower hamlets harass these people. I’ve been particularly depressed by the contrast between the new ‘mall’ and its huge corporate brands, and the traders. I feel like even in my short time here the area has become increasingly sanatised, full of advertising and big label shops, ghettoising the characters who make the place individual. Increasingly I’ve come to wonder at my own role in this as a relatively well off twenty-something who these shops try to appeal to. It certainly leaves a bitter taste in the mouth. In France, which knows a thing or two about markets, individuals have a RIGHT to sell their own produce at any market, without charge. The charges come when you put up a table or have a proper pitch. Now, to me this seems a solvable problem. I live in Kent and not Tower Hamlets but you, esteemed Gentle Author, and Alice above, and any other resident who cares about the way the market runs can contact your local borough councillor, and the TH official in charge of street trading, and ask them to ensure that the market inspectors differentiate between individuals selling their own stuff and commercial stallholders, and cut the former a little slack. It is not hard to differentiate between the two. There are lots of reasons why this is a good idea. The bigger and more successful the market, the more people come, the more everyone benefits including TH. 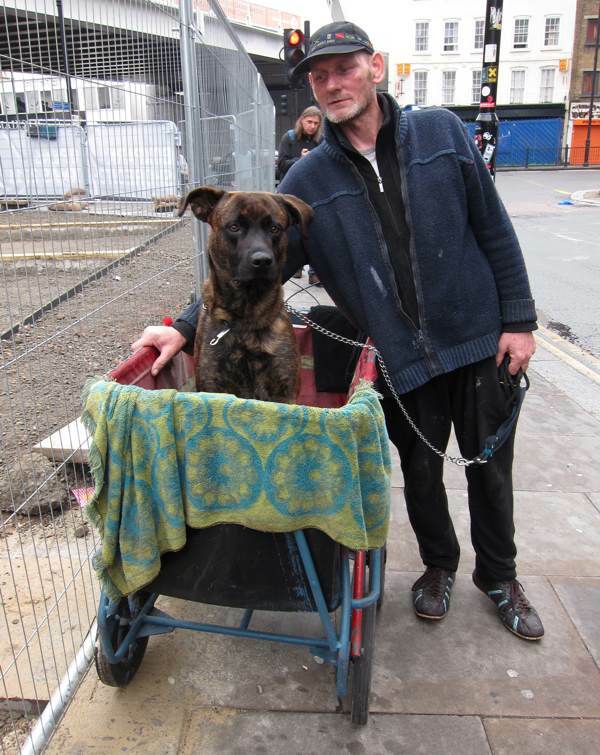 Life is moving along a little easier, with a little more give and take, something most London Boroughs badly need. Please don’t let this idea drop! Good luck, and I look forward to hearing that some progress has been made! Very good article. I totally agree with you, Gentle Author. It’s completely corrupt the way the east end is getting so corporatised and sanitised. 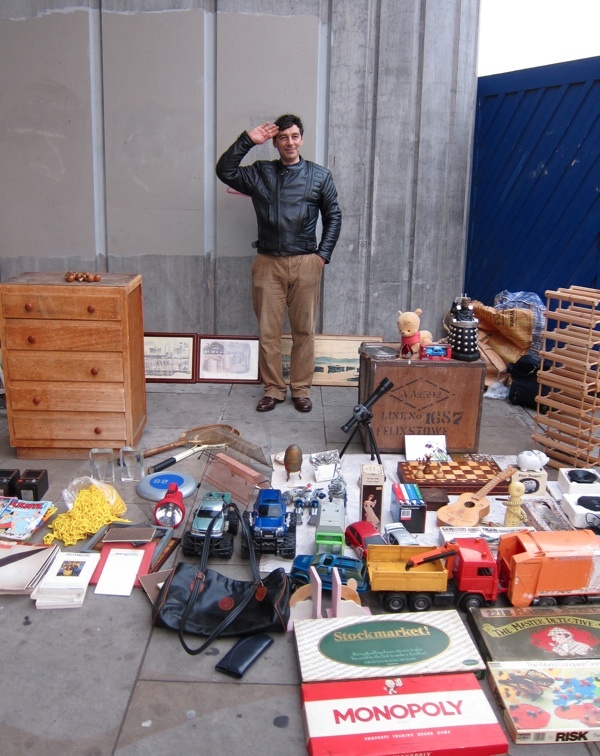 I often buy things off fly-pitchers and I plan to fly-pitch a load of my stuff soon, because I am short of money. I find it more relaxing and fun to buy something surprising off someone in the street than have to go to a ‘mall’. The way things are going I don’t suppose I will be able to afford to live in London in five years’ time, even though this is where my two paying day jobs are and where I want to be because of my writing career. The raggle taggle charm of the east end will soon be blanded out. The 2012 Olympics are another nail in the coffin. I could go on but I am depressing myself…I hope those responsible for planning and development in Tower Hamlets and Hackney Council read this and feel ashamed of themselves. 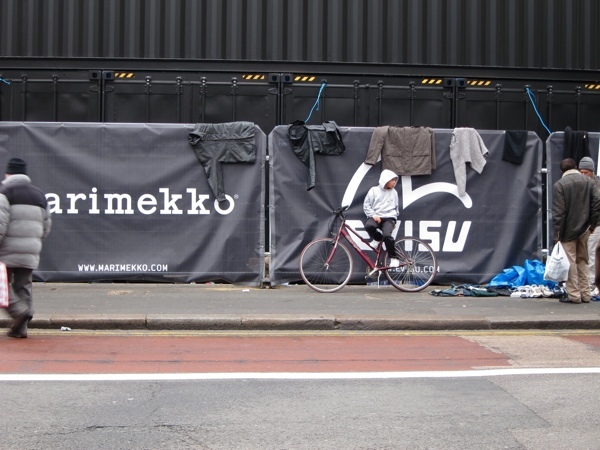 There’s no point in expecting the investors who have bought up that site near Shoreditch High Street tube to understand: they lost their soul years ago, if ever they had one. Who among the readers would like to champion the cause of the fly-pitchers by writing some letters as Jerry suggests? 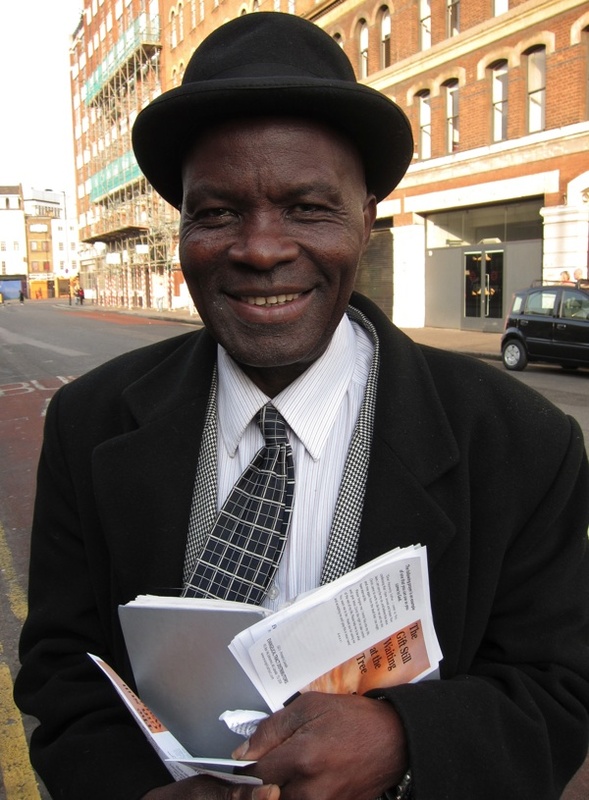 When I was in London about ten years ago I would cross the town every Sunday morning to get there! I’m very happy to know the fly market still struggles to survive. 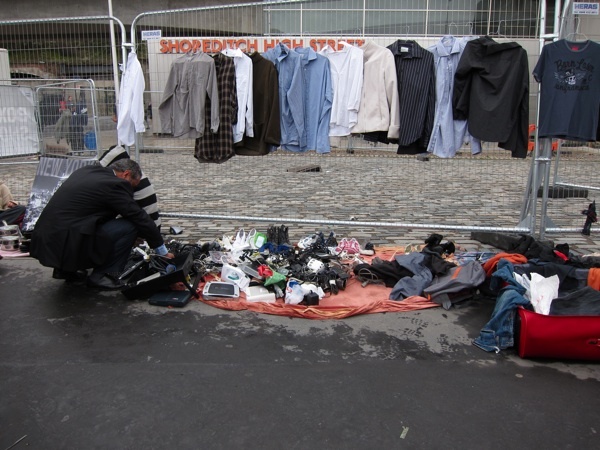 I regularly use some of the objects I bought there, remembering the smiles or the anger of the sellers; human warmth and distress on those dirty pavements are one of the most meaningful things I’ve experienced in London. Great photo of Mr Gil! 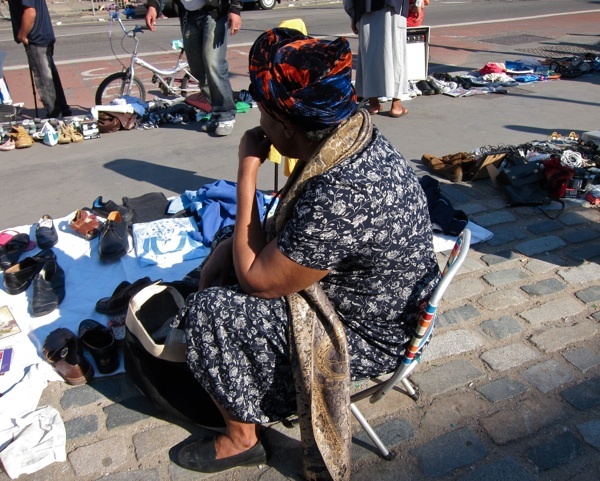 Markets are about social interaction, which we need more of, surely? I can hear the council quoting ‘health and safety’, the same as St Paul’s. How did we get to this sorry state of affairs? when will man be happy , when he cleanses the land of all that makes life so full of light , shade , difference. I will lend my name to any fight for these people. Love the photography, it’s really captured the essence of these traders and the East End. 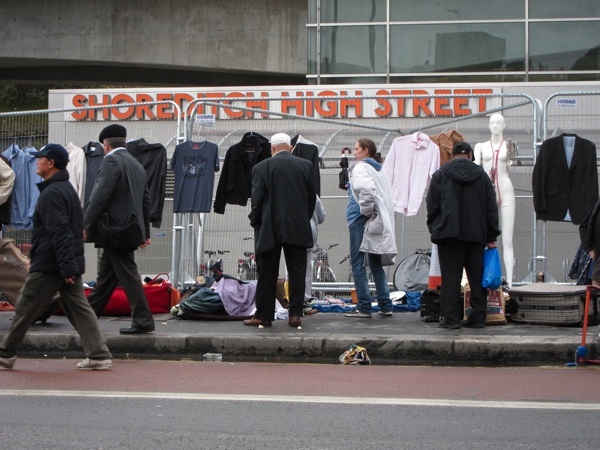 I’ve always thought the traders have helped give the area its soul and its a shame that more and more luxury brands are invading the East End, an inevitable side effect of the government’s gradual plan to price the working classes out of the area. I have just written to Tower Hamlets Council on the standard form provided by their website, and will let you know if my letter seems to have reached the right people, and what, if any, response I get. It is a powerful piece, gentle author, and I so agree with the points made by Alice, JerryWh, Rowena, Jill and Peter. Gerard Manley Hopkins made some good points too! I’m a local, and I’m scandalised by your story. Like Ros, above, I’ve written to Tower Hamlets via the contact form on their web site, and included all my contact details; name, address, phone etc. I’ll report back any contact/outcomes. Yours is a great publication, btw, gentle author. My heart goes out to all those people – how lucky we are to have our comfort and our homes and no worries about the next meal. All those people are very brave and actually I think that in the early 1900′s when my family was living in the East End, it was probably tough, but more liveable than it is now for those depicted in your pictures above. 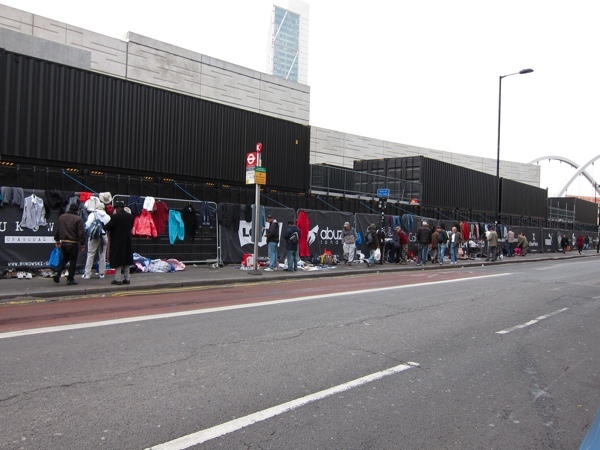 what i love in one of the pictures is the evidence of how the corporate hoarding dressing is fine but people seem to not be any longer – such a crazy world, with Avant Guard tower taking over Brick Lane and the people who are alive are pushed off the streets to become show flat mannequins…. As one of the last flypitchers in London I would like to make a few comments. Firstly Marks and Spencer started off as flypitchers. As you have said Brick Lane has had a culture of flypitching for centuries. But then its getting more and more corporate. And then I only saw a few flypitchers near to Ginas Café selling rubbish. In Camden Passage Islington people used to flypitch. They had a purge every week. Until everyone was afraid to flypitch. 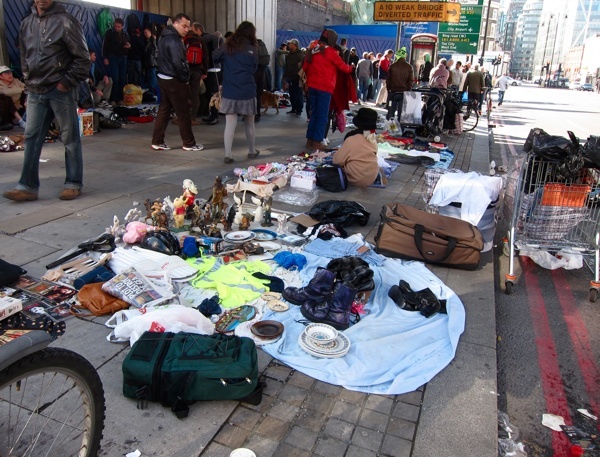 The antique dealers on the stalls and the shops used to buy antiques from the flypitchers and resell the items. As soon as the flypitchers were moved the market went downhill, antique shops closed,Then recently the small market opposite the pub was bought by a corporate developer. Now theres no buzz down there. And its even difficult to rent a council stall unless you go on a waiting list. So if we don’t allow fly pitchers and no one ever tripped over a street full of flypitchers then the corporates will move into Brick Lane too. I hope you can keep on going Susan Stevenson and I hope the fly pitchers will stand guard in old London and prevail against the developers who fail to develop the soul and spirit of the place and instead seek profit after crushing profit. Those who only care about the corporations and who bypass community fail to see that their actions are counterproductive. 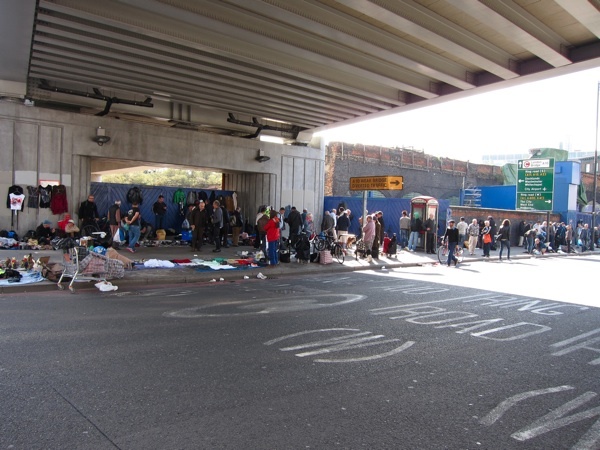 Tourists like me will no longer wish to visit East London because London will be like any city anywhere, coldly devoid of passion and difference.